Mandelson shows we can’t trust the trustees – BP or not BP? The Design Museum’s new exhibition features one of our props, so two of our actor-vists went to the launch party and had a close encounter with an infamous trustee. Is the museum merely performing being radical, or is it ready to get serious about its own ethics? These were the words of the Design Museum’s Chair of Trustees, “Dark” Lord Mandelson, when we asked him how he would respond to the potential ethical dilemma of being offered sponsorship by an oil company. This unlikely encounter took place last Tuesday, at the launch of “Hope to Nope”, an exhibition of political art and design, which features our ingenious BP ruff as one of the exhibits. For once, we were in a museum via an invitation, rather than to launch into a rebel performance – but when we spotted a rare chance to challenge a major trustee over his museum’s sponsorship policies, we couldn’t resist collaring him over the canapés. The exhibition itself was fascinating – a dizzying variety of graphics, props and images from key political moments around the world over the last ten years. And we have to confess to being thrilled by the sight of our slightly battered, oil-stained ruff on display between the Space Hijackers’ Olympics “Official Protester” T-shirts and an explosion of Tr*mp-related graphics. Our BP ruff on display in the Design Museum. Photo by BP or not BP? On the face of it, this feels like a refreshing development: a museum welcoming in the controversy around oil sponsorship of culture, prompting visitors to consider the issue. This stands in stark contrast to the infamous Tate art and activism workshop in 2010 that banned all discussion of the gallery’s (then) BP sponsorship and sparked the formation of Liberate Tate. The Design Museum seems happy to engage further with some of the issues raised in the exhibition through its programme of related events, such as the “How to Fight Fascism” lecture by Mike Monteiro, which looks at “design’s ethical responsibility to address political and social injustice”. Our BP ruff in action, 2012 – 2015. Photos by Natasha Quarmby, Kristian Buus and David Hoffman. “Something something Cambridge Analytica something something Jeremy Corbyn”. Mandelson speaks at the Design Museum’s #HopeToNope exhibition launch. Photo by BP or not BP? Whatever you may think of Corbyn, these comments were jarringly out of place at an exhibition launch. As well as being strangely misjudged for this particular audience (the sense of discomfort was palpable in a room full of political artists and activists, who were being told that creativity and art has little impact in today’s politics), the speech was a perfect example of what Liberate Tate’s Mel Evans has dubbed “Artwash” – using the platform provided by the arts to push one’s own political or commercial agenda, while hiding behind a veneer of cultural respectability or – in this case – the cutting-edge kudos associated with an exhibition of protest art. Mandelson was even wearing a large “Hope to Nope” badge during his speech. Still, we guess he had to fulfil his self-declared mission of doing something to undermine Jeremy Corbyn “every single day”. Knowing what we do about Mandelson’s corporate interests, we weren’t enormously surprised to find – when we approached him after the speech – that he personally had no qualms about accepting sponsorship from oil companies (or “energy companies”, as he pointedly called them), and that the Design Museum had no ethical fundraising policy to guide trustees in this area. He clearly found the conversation uncomfortable, quickly pulling in Museum Director Deyan Sudjic to field our queries instead and then suddenly walking off halfway through one of our questions. The things is, to have an intensely pro-corporate figure like Mandelson as a museum trustee isn’t unusual – it’s the norm. Like the British Museum, most of the Design Museum’s trustees are drawn from the world of business and finance. This means that unless there are clear ethical guidelines in place for them to follow, we shouldn’t be surprised to see Trustees approving sponsorship deals with all kinds of corporate baddies, no matter what other work museum staff and curators may be doing to champion progressive ideas, promote equality and diversity and reduce their museum’s own environmental impact. The label for our ruff in the Design Museum. Photo by BP or not BP? Sudjic himself engaged more thoughtfully with our questions and acknowledged the controversies here, even citing the example of Shell’s attempt to influence the climate exhibition it was sponsoring at the Science Museum (a controversy that our group helped to expose). We acknowledged the challenges of museum funding in a time of arts cuts, but pointed out that according to the Museums Association it is best practice for museums to have ethical funding guidelines, and that many institutions already do so. He responded that “being challenged to think about these things seriously is important” – let’s hope he meant it. If he did, this web resource from Culture Unstained on ethical arts sponsorship would be a good place for him to start. * The museum is currently posting examples of political art on its social media feeds, and inviting its followers to engage in a “Hope to Nope” debate. We would like to see them share an example of art directly challenging museum ethics, such as the recent “permafrost crack” we installed in the British Museum, or one of Liberate Tate’s powerful pieces of performance art such as Crude/Sunflower or Birthmark. * The museum should invite someone from the Art Not Oil Coalition to speak at one of the events linked to the exhibition, such as “The Visual Language of Protest”. We’d be happy to put the museum in touch with some excellent speakers. * The museum could even organise an event specifically to debate the ethics of museum funding, which is a very hot topic at the moment, and invite their Chair of Trustees to answer the question he walked away from. * To make sure it has a robust ethical fundraising policy and an environmental policy that encompasses fundraising, and that these are available on its website. 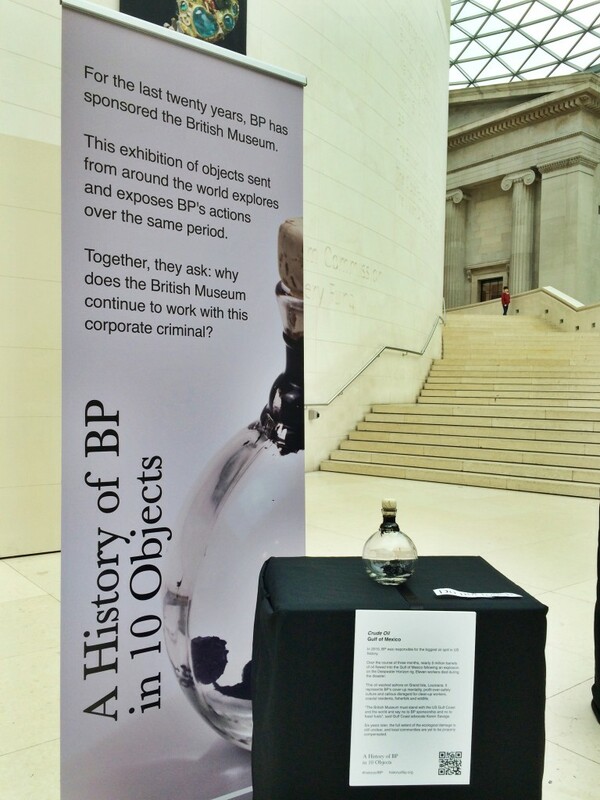 We hope that the museum is ready to take these kinds of steps, and not just use our BP ruff as part of a performance of radicalism, while behind the scenes its gung-ho Chair is cosying up to whichever corporates might come knocking. The 2012 film of our BP ruff in action for the first time. Join us for some serious Mischief against BP on Saturday June 16th! Lord Mandelson’s comments at the opening night were not just inappropriate but deeply offensive in this context. Here we have a group of activists and designers who have lent their work, for free, to Design Museum to build an exhibition. Instead of celebrating the work of the people who laboured for free to make the exhibition that provides content for his museum, Mandelson took the opportunity to insult both the contributing design activists, Design Museum staff who selected the design activists’ work, and UK social movements largely in support of Jeremy Corbyn. Mandelson should apologise publicly for this despicable behaviour.